Ever wondered what it would be like if a team that normally works exclusively in the realm of Formula 1 would produce if they turned they attention to a proper road-worthy car? Well, wonder no more as Red Bull Racing has teamed up with luxury car manufacturer Aston Martin to create a concept vehicle that bottles the intensity of professional racing under a regular hood. The AM-RB 011 project, which is so secret the two firms are still only willing to release concept sketches that actual photos, aims to combine a lightweight carbon fibre frame, a two-seater setup, a high-revving naturally aspirated V12 engine and a 1:1 power to weight ratio. Aston isn't even willing to release any cast iron specs yet, but it has said it's working on both road and racetrack versions. 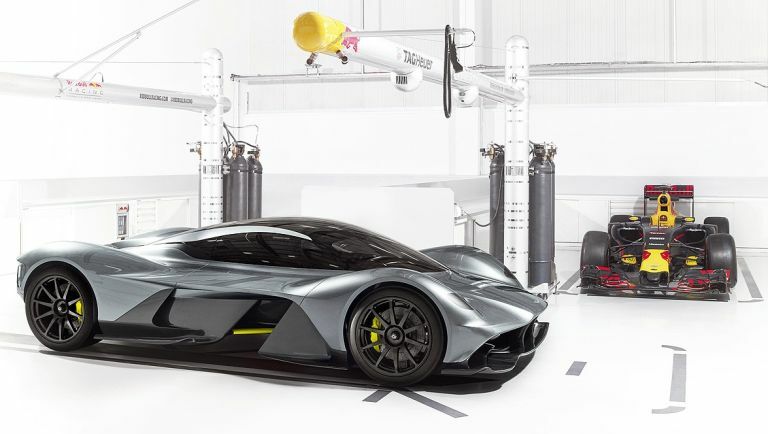 A project headed up by Adrian Newey (Red Bull Racing's Chief Technical Officer and F1TM designer), Marek Reichman (Aston Martin EVP and Chief Creative Officer) and David King (VP and Chief Special Operations Officer), the AM-RB 011 will be built by King and his team at Gaydon, in the purpose-built facility created for Aston Martin's original hypercar, the One-77. The race track version could well be a beast on race day, too - the two teams are looking to create a vehicle that's in line with that of today's LMP1 Le Mans sports prototypes. "I've long harboured the desire to design a road car," says Red Bull Racing's Chief Technical Officer of the AM-RB 001 project. "Avanced Technologies brought me a step closer to realising that ambition, but I believed we should work with an automotive manufacturer. Aston Martin was at the top of my list. The synergy between Red Bull Racing and Aston Martin is clear. I knew Red Bull Racing had the ability to handle the pure performance aspects, but Aston Martin's experience of making beautiful, fast and comfortable GT cars is of great benefit to the project." He adds: "I've always been adamant that the AM-RB 001 should be a true road car that's also capable of extreme performance on track, and this means it really has to be a car of two characters. That's the secret we're trying to put into this car - the technology that allows it to be docile and comfortable, but with immense outright capabilities." The collaboration aims to create between 99 and 150 road-worthy versions and 25 track-based ones, with a projected shipping window sometime in 2018.